Rugged punch clock! Excellent for workshops or small offices. Prints three copies deep. Long lasting cartridge ribbon. Metal frame, heavy-duty printer. Tr880d Electronic Time Recorder. Precision quartz accuracy. Prints IN/Out 6 times a day, drops to next line automatically. Simple, reliable. Most reliable time clock there is. Atomic Clock. Made In USA. Virtually maintenance-free. Resets after power outages, daylight savings, leap year, month, etc. Large print. 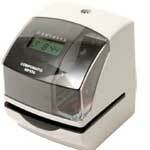 The Compumatic MP550 is easy to set up, can be used as a time clock, time/date stamp, or numbering machine. It has a cartridge ribbon, resets after power outages, daylight savings, more. Icon SP-250 punch clock, also rings bells. Solid machine, digital display, cartridge ribbon, resets after power outages to the correct time. Many print formats to choose from. Can also ring bells! New for 2019. 5 print formats, updates for power outages, daylight savings, leap year. Tru-Align feature, silent printing, no ribbons! Free Shipping USA-48 States. Prints two lines! Normally used as a time clock - prints date and time, can be used to print a note, and date-time on two different lines. 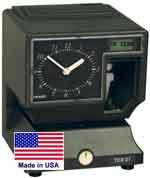 Stand alone multi-function punch clock and date time stamping machine by Lathem. Prints on time cards and all paper documents. Electronic with a ribbon. Read more, below. 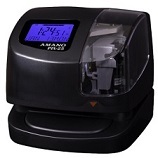 Amano CP5000 non-totaling top-loading time clock. Self-aligning, unlimited employees. CP5000-A341 Free Shipping in USA-48 states. IN STOCK at our NJ Warehouse. Punch clocks for sale! Always in stock. Since 1991, we have been selling and servicing punch clocks.